After suffering through two sub-par games based on the live-action films, do Transformers fans finally have the video game worthy of the franchise in War for Cybertron? In 2004, developer Melbourne House and Atari gave us a glimpse at how good a Transformers game could be in the Transformers Armada-based game for the PlayStation 2. Then Michael Bay got his hands on the franchise, and both Traveller's Tales and Luxoflux tried and failed to create compelling video games based on the two live-action films. Now Darkwatch developer High Moon Studios takes a crack at the beloved bots, bypassing established fiction in favor of creating its own take on the early days of the Decepticon/Autobot conflict in Transformers: War for Cybertron, a third-person shooter built using Epic's Unreal Engine 3. Can this unique perspective breathe new life into the franchise, or is it just bad comedy? Robots In Disguise: High Moon Studios took on a tremendous task in redesigning iconic Transformers characters to fit its vision of ancient Cybertron. Over the years we've see many different versions of Optimus Prime, Megatron, Bumblebee and friends in their Cybertronian forms, from the 80's cartoon versions to the War Within comics from Dreamwave. What the developers have created is an amalgam of these many appearances with a distinctive flair all their own. Each character is a highly impressive piece of machinery. More than simply static models, parts shift and move as they idle, giving the impression that these characters are alive. Sure, many of the bit characters and cannon fodder look similar, but a race of robots doesn't need much variation, at least until they wind up hiding on Earth millions of years in the future. A Strong Story: Free from the continuity established in the cartoon, comic book, and movie series, High Moon has created an alternate version of the final days of the Cybertronian War that actually makes sense. Split into two campaigns, one for each faction, the story follows Megatron and his crew on a mad grab for ultimate power before swapping sides to explore how the Autobots react to his mad scheme. It's all wrapped up in an ending that ties together nicely with the 1984 cartoon series, while remaining far enough removed from those roots to keep veteran fans on their toes. Witty Banter: Just because the action is fast and furious doesn't mean War for Cybertron keeps the ‘bots' personalities in check. As you play through each chapter, the Autobots and Decepticons on your team banter back and forth, instilling much-needed humor and sometimes even warmth to the proceedings. Teamed with Optimus Prime and Warpath, Ironhide questions the wisdom of bringing the brash young tank with them on an important mission, which later develops into a friendly competition between the two characters over who can take down the most Decepticons. After a particularly harrowing mission, paranoid Decepticon Breakdown voices his relief, at which Megatron quips, "Yes Breakdown, your incessant whining has seen us through." The exchanges add humanity to an otherwise cold, mechanical world. A Solid Shooter With A Twist: While its Unreal Engine 3 base might bring out the Gears of Wars jokes, War for Cybertron compares more favorably to the Halo series than Epic's franchise. The action is fast and tight and the controls are quite intuitive. While there's no real cover system, you won't want to be caught dead in the middle of an open battlefield. There are weapons for every sort of shooter fan present, from long-range sniper rifles to in-your-face heavy chain guns, and you can pretty much play as you like. Of course the twist here is you can transform into various vehicles modes, and it's much more than a simple gimmick. Each side of the conflict has a chapter dedicated to flying, and with enemies that can only be killed from behind, the extra burst of speed granted by turning into a car is invaluable. The gameplay is nicely varied, with bosses that require special tactics to defeat, areas that require a little stunt driving, and even a little shooting while in free-fall. My personal favorite however has to be the rail-shooting Autobot turret section, which oozes pure 80's cartoon campiness. Massive And Multiplayer: With the single-player campaign only lasting three or four hours per faction, the meat of War for Cybetron is found online, pitting your robots against real-life opponents. Multiplayer is a class-based affair, with Leaders (trucks), Soldiers (tanks), Scouts (cars), and Scientists (planes), each with their own set of powers unlockable as you earn experience points in battle. Modes range from familiar fare like Deathmatch and Team Deathmatch to slightly more obscure modes such as Countdown to Extinction, which seems the teams trying to plant an active bomb in each other's bases similar to Halo's Assault mode. Each is satisfying in its own way, but the true joy of War for Cybertron multiplayer comes from the sheer chaos generated by large groups of constantly shifting combatants. Driving your car off a ledge, transforming in mid-air, and taking out an enemy flyer with a well-timed melee attack is an experience you'll only have in War for Cybertron. Escalation: War for Cybertron also includes multiplayer co-op in three different flavors: campaign co-op, competitive campaign co-op, and Escalation. While the former two are entertaining enough, Escalation warrants singling out. Much like Gears of War's Horde Mode, you'll be facing off against increasingly difficult waves of attackers. The twist here is that as you fight, you earn points that can be used to buy health, weapons, and ammo, or you can opt to spend them on unlocking new areas of the battlefield, giving your team access to new weapons and power-ups. While it is a cooperative affair that requires a great deal of teamwork, players who excel at the game control the battlefield. In more than a few Escalation rounds I found myself saved from destruction by a benevolent player spending points on health and ammo just to keep me supplied. That's teamwork right there. Fan Service: The folks at High Moon know Transformers, and they take every opportunity to showcase that knowledge. It's in the famous Transformers locations you'll visit throughout the game. It's in the achievement and trophy names. It's in the witty back-and-forth between characters. The 1986 animated movie seems to be a prime target for quotes, right down to the universal greeting, "BBah-weep-Graaaaagnah wheep ni ni bong." They almost go overboard with it. Rumble's "First we crack the shell, then we crack the nuts inside!" only works if there's actually some sort of shell being cracked. I suppose too much is better than none at all. Till AI Is Dumb: Unless there are enemies in the immediate vicinity, don't expect much from your AI teammates in the single player campaign mode. Outside of basic combat maneuvers and moving from point A to point B, they aren't much help. For example, during the Autobot campaign I was faced with two corridors filled with cloaking enemies. At the end of each there was a switch I needed to push. I had one sliver of health left, and my teammates were not following me down the corridor to provide backup. I ended up pushing Optimus Prime ahead of me until he acknowledged the bad guys. Who picked this guy to be leader again? More Customization Please: The chance to create your own Autobot or Decepticon for online multiplayer, for me, was one of the most attractive features of War for Cybertron. Unfortunately the cosmetic options here are severely limited. Your chassis selection is severely limited, with some class/faction combinations only having one option. I would have liked to see a more involved character creation system, perhaps one with different parts for each class, letting players customize, for instance, which turret their tank carries, or the wings on their jet. Maybe next time. High Moon Studios hasn't simply created a game based on the Transformers license. They've taken the license and, in conjunction with Hasbro, made it their own. Perhaps that's the key to creating a successful video game based on an existing property. Just as filmmakers take liberty with comic books in order to make them more suitable for the big screen, perhaps video game developers need more room to move as well. It's certainly worked out well in this instance. High Moon has taken their love for the Robots-in-Disguise franchise and a healthy dose of creative freedom and transformed them into a Transformers game that fans and non-fans alike can get behind. Till all are one! 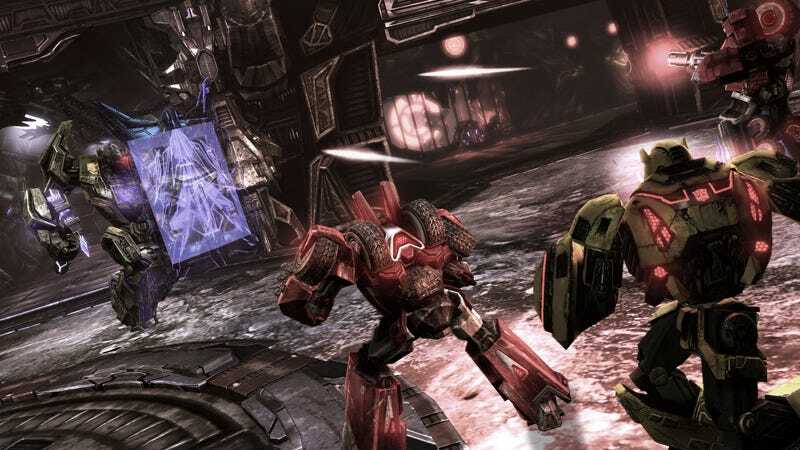 Transformers: War for Cybertron was developed by High Moon Studios and published by Activision for the Xbox 360, PlayStation 3, and Wii on June 22. Retails for $59.99 ($39.99 PC) USD. A copy of the game was given to us by the publisher for reviewing purposes. Played through both sides of the story on Standard difficulty. Logged several hours of multiplayer time. Reached wave 16 in Escalation before we died horribly.